It’s actually been a rather pleasant week weather-wise on the peninsula and the first weekend of February is set to be the first weekend of the year where the temperature is above 0C. A return to the winner’s circle for one of Korea’s most prolific horses meant another milestone in the career of the nation’s most prolific ever jockey as Park Tae Jong partnered Ace Galloper to victory at Seoul Race Park on Sunday afternoon. Ace Galloper (Chapel Royal) had been without a win since June of last year but had been coming back into form over the winter. The six-year old duly took advantage of a relatively weak class 1 field to cruise to a 7 length triumph and remind those present while he is still rated the top Korean-born competitor at the track. He now has 18 wins from 31 career starts. The race marked the 4th win of the weekend for jockey Park Tae Jong and more significantly, the 1800th triumph of his long career. So dominant has Park been for so long that he has ridden over 1000 more winners than any other Korean jockey in history. The 47-year-old debuted in 1987 at the old Ttukseom Racecourse. By any standard, 1800 is a considerable number of wins but his achievement becomes all the more remarkable given the fact that for the first 18 years of his career, he was – as per the rules at the time – restricted to just 5 rides each week. Ace Galloper wasn’t the only horse getting back to winning ways after a long time drawing a blank. Lion Santa (Lion Heart) won his first 9 races at Busan in 2010 and 2011 but had only managed to add a single additional victory to that tally in an injury ravaged 14 months since. Yesterday, in the first of co-feature races, he was back to his old self. Although only sent off as 4th favourite, Lion Santa stormed up the rail in the final furlong to comprehensively defeat a competitive class 1 field with Yeonseung Daero (Creek Cat) and up and coming star Wild Myeongun (D’Wildcat) a full 4 lengths behind. Lion Santa is now on 10 wins from 14 starts and goes straight back into consideration for big Stakes races later in the year. The Korea Racing Authority (KRA) has announced plans to host its first “international race” by inviting three Japanese-trained horses to Korea to compete for a 250 Million won prize on September 1st. Subsequently, three Korean horses will be selected to race in Japan in November. The KRA will be picking up the costs of all those involved and plans to promote the race in the same way an international football match would be. At the same time, the Authority also announced plans to hold a truly international race in 2014 with horses trained in the USA, Australia, Hong Kong, Macau and Malaysia expected to be invited. It’s not the first time the racing authorities here have planned to hold an international event. Such a race was planned to be the culmination of a “five-year plan for intenationalization” drawn up in the early 2000s and a similar race is pencilled in to mark the opening of the now delayed new racecourse at Yeongcheon. While the International Jockey Challenge, which was also part of that original plan, is now an established feature of the calendar and Korean-bred horse Feel So Good – likely to be one of the Korea horses selected for the event – ran and won in the US last year, progress on hosting foreign horses in Korea has until now, been slow. The KRA already operates exchange races with a number of its counterparts around the world (the great Irish horse Sea The Stars broke his maiden in August 2008 in a race sponsored by the KRA at Leopardstown), including the JRA and some of these have seen jockeys from the partner organisations visiting. Busan Racecourse also has a partnership with Kokura Racecourse in Japan. However, none of these arrangements have involved horses travelling to compete. After a slightly warmer week. the temperature is set to plunge back way below zero as another weekend of racing gets underway in Korea. Lion Santa (Lion Heart), who’s won 10 of his 14 starts to date returns to action at Busan on Sunday after a long spell out with injury. The 5 year old will take on Yeonseung Daero (Creek Cat) and up and coming US import Wild Myeongun (D’Wildcat) among a full field of 14 in the first of co-feature races. Korean Derby winner Jigeum I Sungan (Ingrandire) was a comfortable three-length winner on his season debut at Seoul Race Park on Saturday. The colt, who won two legs of the Korean Triple Crown in 2012, was sent off at slight odds-on for the 1900 metre feature Handicap. With regular rider Moon Se Young currently in Macau, the four-year old was partnered by young up-and-comer Seo Seung Un for the first time and it didn’t take the pair long to gel. Kept in the middle of the pack for much of the race, Jigeum I Sungan still had five horses in front of him as they entered the final furlong. One after another they were picked off as he eased to the front and ultimately won going away from the field. Magnifique (Menifee) was second with Singgereounachim (Exploit) in third. Despite his double Classic triumph and subsequent Horse of the Year award, today’s win was only Jigeum I Sungan’s 7th from 16 starts. However, throughout last year he got better with every run and the feeling is that the best is still very much to come from him. 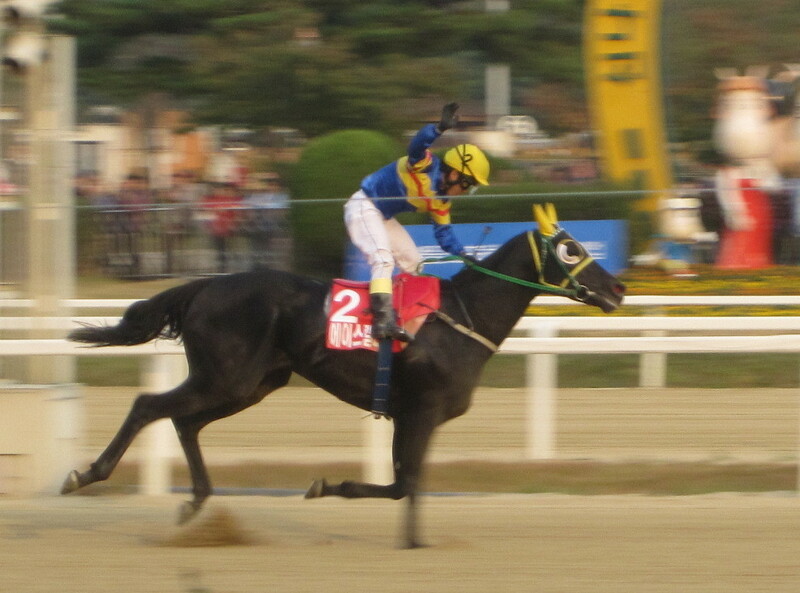 On his last start, Jigeum I Sungan was well beaten into 2nd as Dangdae Bulpae strolled to his third consecutive President’s Cup. November is a long way away but stopping Dangdae Bulpae securing a historic fourth win in Korea’s richest race is surely the season goal for Jigeum I Sungan. The preparation has begun well. Last Saturday afternoon at Seoul, something happened that would have been unthinkable just a few years ago. Race 7, an otherwise unremarkable domestic class 4 allowance race, was won by jockey Yoo Mi Ra. 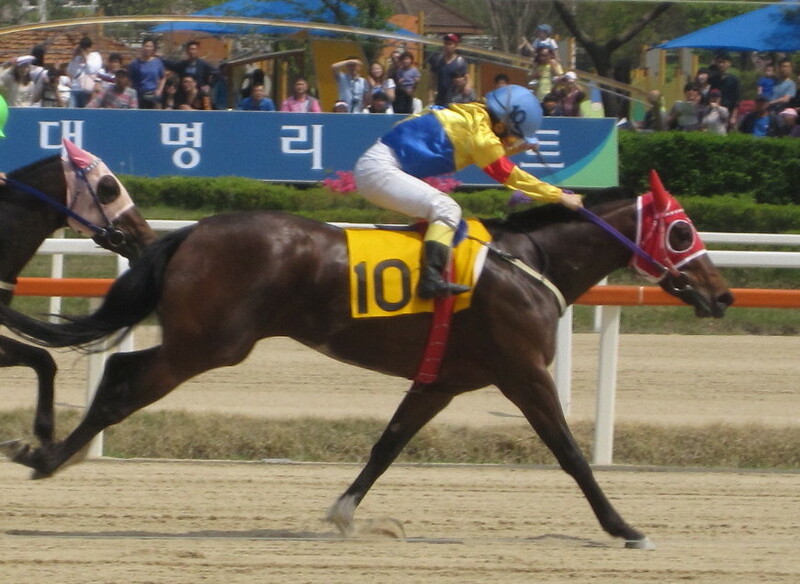 The second place horse was ridden by Kim Hae Sun and Ahn Hyo Ri was on the third. 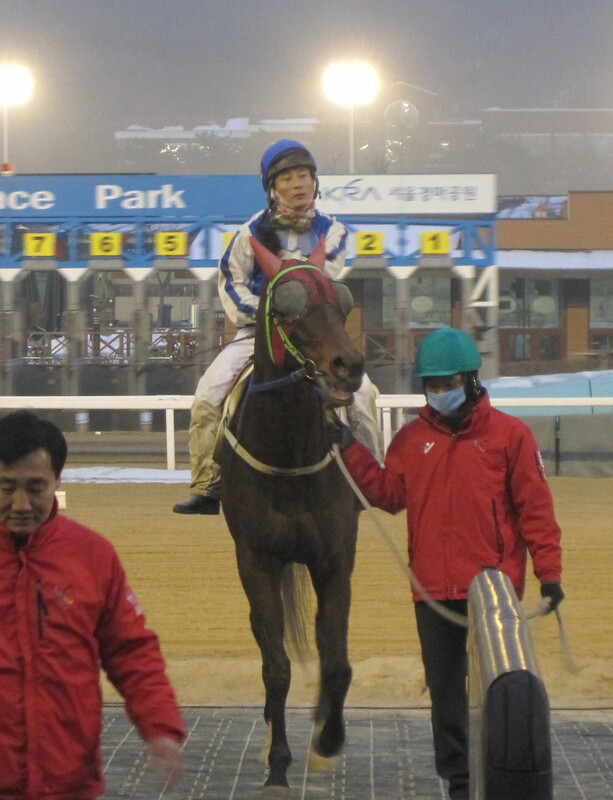 Female jockeys had swept the placings for the first time ever in Korea. Earlier in the afternoon, a horse called Dewma had given Lee Shin Young, Korea’s first female trainer, her 39th winner and the following day, Sunday, saw Lee Ah Na ride Imperial Girl to second place behind Tough Win in the afternoon’s feature event. It is questionable what would be the more unlikely: that by 2013, South Korea would have a female President or that women would be performing so strongly in the traditionally ultra male dominated world of Korean horse racing. Park Geun Hye was elected the nation’s first female President last month, however, somewhat surprisingly, you have to go back to the now long-gone Ttukseom Racecourse on the north bank of the Han River and to the Spring of 1975 when 21-year-old Lee Ok Rae became the first woman to be granted a jockey license in Korea. South Korea was, at the time, under the authoritarian rule of President Park Chung Hee – father of the new President Park Geun Hye – who had recently survived the second of three assassination attempts – this one had resulted in the death of his wife. 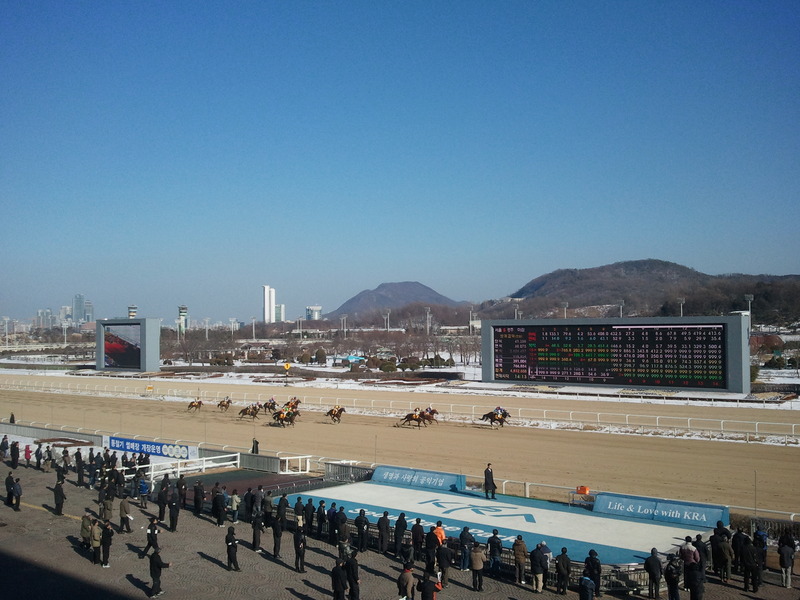 Then, as now, racing held a near monopoly on gambling and Ttukseom was full to bursting on each race-day. Lee Ok Rae graduated in the same class as Bae Dae Sun and Ji Yong Cheol, who would go on to become two of the top riders of their generation and today are among the country’s most successful trainers. Assigned to trainer Kwon In Deok, on March 17 that year, Lee rode in her first race. In true storybook fashion it was a winning debut as in race 4 that day, she partnered horse number 1, “Kansas” to victory over five and a half furlongs. Lee continued to establish herself over the coming months, however, in August that year, disaster struck in the shape of a fall in which she sustained injuries that would end her career. She retired just six months after her first ride with seven wins from forty-eight starts. No Korean woman would ride in a race for the next quarter of a century. By the time they did, Park Chung Hee had been dead for two decades and his once bitter enemy Kim Dae Jung was now President of South Korea. Seoul had hosted the Olympic games in 1988 and Ttukkseom Racecourse was closed as the huge new track at Gwacheon opened, having been constructed on the site of the Olympic Equestrian events. At the turn of the millennium, the KRA made an effort to get more women into the sport. 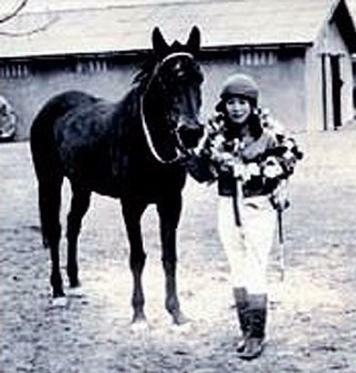 In 2001, two jockeys were granted licenses, Lee Keum Joo and Lee Shin Young. They were followed a year later by Lee Ae Li and Park Jin Hee. Lee Keum Joo and Lee Ae Li are these days occasional riders, the former having only ridden sporadically since her marriage while the latter, despite retaining her popularity with punters with her “Ae Li Gongju” (Princess Ae Li) image complete with pink silks and boots, has only ridden 50 times in the past year. Of Lee Shin Young and Park Jin Hee, we will return to shortly. Tragedy struck the next intake. Granted a license in 2005, Lee Myoung Hwa took her own life shortly afterward. She was found to have been suffering from depression that is believed to have been exacerbated by worries about constant reducing to make weight. A year later, newly licensed Kim Seo Jin quit before her first ride. In 2006, female jockeys received mainstream publicity in Korea with the release of the movie “Gaksoltang” (Lump Sugar). Starring actress Im Su Jeong as a jockey and largely shot at Seoul Race Park, the movie is, for its acting and focus on the horse as a star, arguably one of the best racing movies ever produced (Click here to see trailer.). KBS Television produced a one-off documentary about Lee Ae Li to coincide with the film’s release. 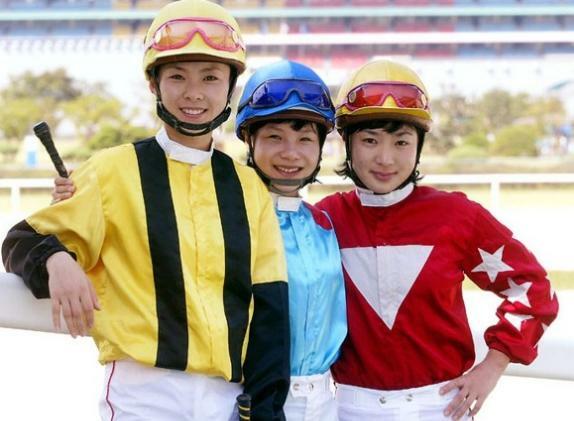 Meanwhile, down on Jeju Island Kim Joo Hee and Na Yu Na became the first women to receive jockey licenses for the pony racing there. Kim was formerly a promising athlete while Na was an Aerobics instructor. Both have become prolific winners with Na becoming the first woman to reach first 100 – and now 200 – career winners as well as landing the prestigious KRA Jeju Cup. Na and Kim have found it easier to compete riding the Jeju ponies than their counterparts have on the thoroughbreds on the mainland and in a short time have risen to first and third in the all-time female winners list. They’ve been joined in recent years by Kim Da Young who is also winning regularly. Back in Seoul, Yoo Mi Ra qualified in 2008. She along with 2010 graduate Park Jong Hyun have struggled to gain much of a foothold but are still working hard although Yoo did make all to win that historic race on Saturday. 2010, however, saw another desperately sad turn of events, one that shook everybody involved in racing here. Having begun racing at Seoul in the same graduation class as Lee Ae Li, Park Jin Hee moved to the new track at Busan when it opened in 2005. She started riding winners and became well established but in 2009 her form began to dip. One Friday in March 2010, she failed to appear for her rides. After the alarm was raised, she was found dead in her apartment. She was 28. Park Jin Hee left behind a detailed suicide note, outlining what she believed to be unfair treatment and bullying in racing in general and that she in particular had suffered, principally from trainers. The recriminations were bitter with the jockeys and trainers unions engaging in furious rows. Nearly three years on and for all that Busan is a much more progressive track than Seoul in terms of its raceday operation, its rules and its openness to foreigners, no Korean woman has been licensed at the track since. Later in 2010, the Korean movie industry once more turned its attention to female jockeys as Kim Tae Hee starred in “Grand Prix” Unlike Gaksoltang, however, this was not a movie to live long in the memory. At Seoul Lee Shin Young, who qualified as a jockey nine years earlier, sat and passed the exam needed to gain a trainers’ license. She continued riding for nearly a year until, with 90 winners to her name, a barn became vacant. On July 1, 2011 and still only 31 years old, Lee Shin Young surrendered her jockey license and became Korea’s first female trainer. She has started well, saddling 35 winners including one in a listed race. Her barn now has 24 horses in it, including Feel So Good, the first Korean bred horse to win a race in the US and she is thought of as one of the most promising talents on the backstretch. As a jockey she had an aggressive style which landed her in the stewards room far too often. It is an attitude has served her well in an environment where many people were hoping for her failure. On the track, Lee Shin Young’s protegé is Kim Hae Sun who has 80 winners to her name. A product of the Seoul Jockey Academy, which has started to churn out a series of promising young riders who have been putting their elders to shame, Kim along with 2011 graduate Lee Ah Na and 2012’s Ahn Hyo Ri, have every chance of making it to the very top. ** There have also been three Japanese women riding in Korea and all of them have been successful. 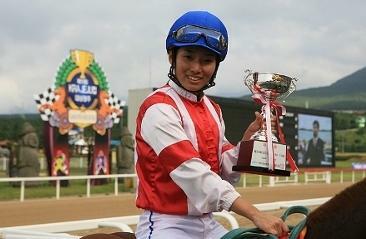 Mai Beppu rode at Seoul in 2011 while Hitomi Miyahsita rode plenty of winners at Busan in 2009/2010. Akane Yamamoto also had a successful speel at Busan in 2011/2012. Unfortunately, Akane suffered a serious injury in a paddock accident in Japan last year. *** This post is an updated version of one published on this blog back in 2009 titled “Korean Racing Girls”. Much of the information for that original post was sourced from the excellent Korean language blog “Enjoy Horse Racing” whcih is still going strong. Tough Win may have lost his Grand Prix Stakes title to Gamdongubada last month but the six-year old showed he’s still the horse to beat at Seoul as he began 2013 with a routine win this afternoon. Sent off the overwhelming favourite and back at his favoured 1800 metres, Tough Win (Yonaguska) was never troubled as he coasted to a six-length victory. 60/1 outsider Imperial Girl (Imperialism) was the well-beaten second while Stakes winners Kkakjaengi (Put It Back) and Nolbu Manse (Simon Pure) trailed in fourth and fifth. The victory was Tough Win’s 19th from his 26 starts and jockey Cho Kyoung Ho, who missed the mount in the Grand Prix due to suspension was clearly a very happy man as they crossed the line. One race earlier, former champion filly & mare Top Point (Tom Cruiser) made her return to racing after a 6-month lay-off. And it was an encouraging performance as, while the race was won by 66/1 Brothers (Vicar) she finished a close third just a length back. Now 9-years old, Top Point still looks as though she has a season or more’s running in her. Down at Busan, Geyongbudaero (Menifee) made his Open company debut. In the absence of the well-fancied Prince Kingdom, last year’s KRA Cup Mile winner was backed into favouritism, however, he ran slap-bang into an in-form Viva Ace (Macho Uno) who started quickly and made all to pull-off an 8-length romp. 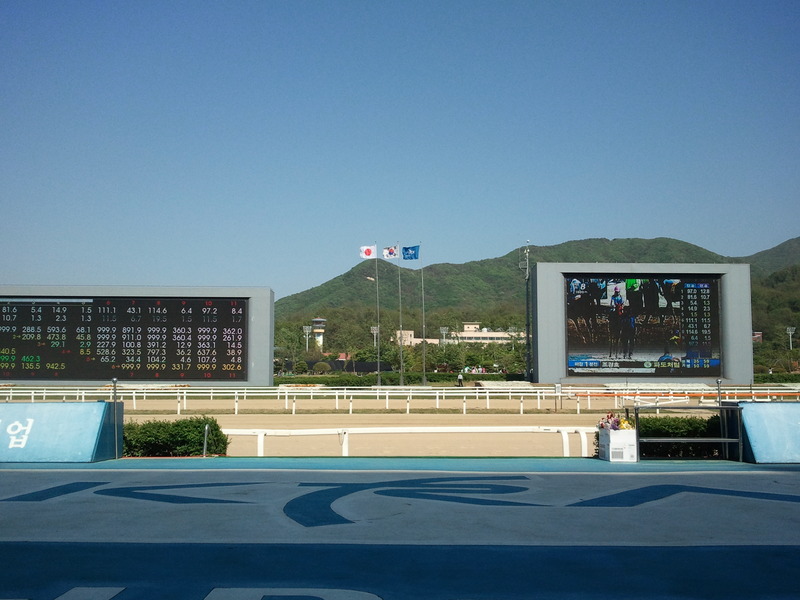 Viva Ace has been one of the most consistent – and underbet – horses at Busan. Very rarely sent off as favourite, he has now amassed 11 wins from his 22 starts. Also at Busan, there was success for the new combination of the track’s best Korean jockey Jo Sung Gon and only foreign trainer, Peter Wolsley. The pair combined to win the first of the co-feature races with Secret Whisper (Sea Of Secrets). The 5-year old mare has now won 8 of 19 starts.